This 2018 Boston Consulting Group study covers more than 2400 firms worldwide. A fascinating report, it’s one of a series of twenty produced since 1999. The value creation measure is Total Shareholder Return (TSR) – the percentage rise in a firm’s share price plus dividends paid over a 5-year period. BCG terms it the bottom line measure for investors. Six so-called “investor-focused” metrics underpin TSR to address sales growth, margins, EBITDA, dividend yield, change in the number of shares outstanding, and debt. But do they make for a good measure of management’s competence? After the dotcom collapse, one of BCG’s early value creator reports was sub-titled Back to Fundamentals. The two prime ones being cash profitability above the cost-of-capital and profitable investment growth. They found the latter had most impact on TSR – about 70% of it. However, the growth doesn’t have to be that profitable to get you a high TSR%. Capital market and investor expectations of future performance drive it most. Moreover, we know well enough that share premiums driven by high hopes can suddenly vanish. We saw that with Didata in the dramatic 2001 dotcom collapse, the banking fiasco, and Steinhoff in 2017. Or, they disappear over time. And they do, without exception. So what fundamentally drives sustainable, profitable investment growth? For that, BCG uses a measure developed by Credit Suisse, or certainly used to, called CFROI – Cash Flow Return on Investment. It’s a complex one for operating managers to understand and use. Besides that, their task is not to make a return-on-investment, it’s to make a return on assets. The only valid measure of a manager’s intent and results is a physical productivity ratio. The one that fundamentally drives the long-term value of a firm derives from productivity managers generate from assets they manage (ROAM) – two key ones being ATO (Asset Turnover) and ROS (Cash Operating Profit Return-on-Sales%). 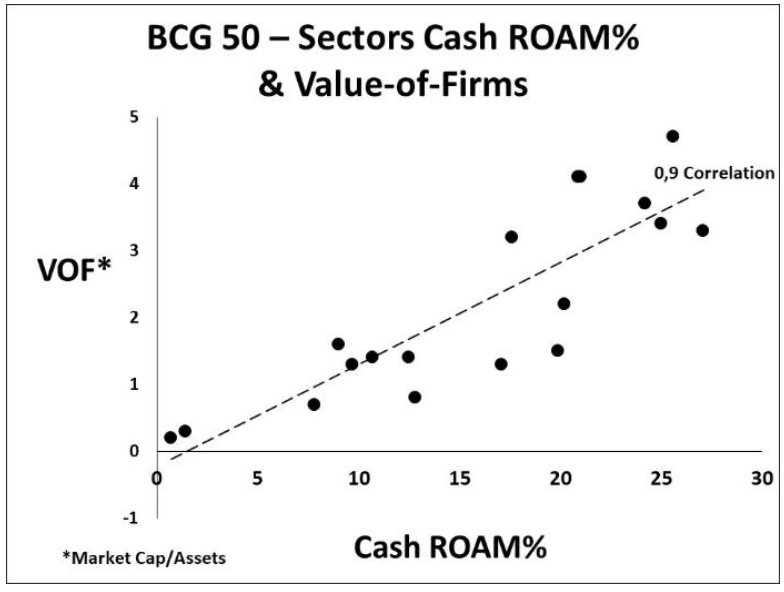 So, to simplify matters, look instead at BCG’s Top 50 Value Creators through a Cash ROAM lens. Link it to BCG’s TSR% measure first and then to a different value metric – Market Cap ÷ Total Assets. Here’s the TSR measure first in a cause/effect chart. There is no correlation at all. But maybe I have the wrong end of the stick, so let’s look a bit deeper. 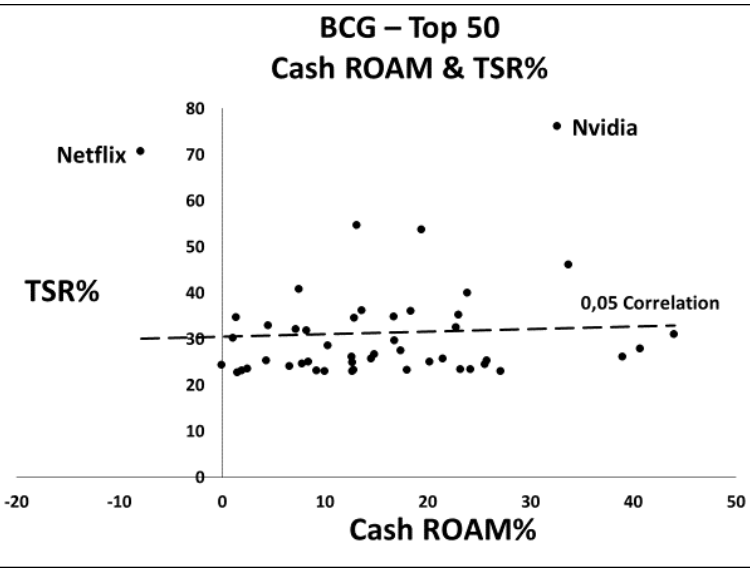 The two outliers are Nvidia with its high Cash ROAM and high valuation, and Netflix with a negative ROAM but also highly valued. However, despite no link between asset productivity and TSR, the picture changes when you compare relative ROAM performance and market value amongst firms. A much stronger cause-effect – the correlation is 0.6. It would be much higher at 0.8 if two outlying, low ROAM performers, Netflix and Naspers were taken out. Naspers is propped up entirely by its 31% ownership of Tencent. Its value is deeply rooted in it. Chairman Koos Bekker’s brilliant investment of $32m made in 2001 is now worth about $120bn. The firm itself is worth around $90bn. Today, but it may change in future, the rest of its portfolio makes minimal contribution to the Value-of-the Firm (VOF). For now, Naspers sits on Tencent like an Ox Pecker cleaning out ticks in the ears of a buffalo. So, as an investor, focus your field glasses on the buffalo’s ROAM, not your pecker’s. 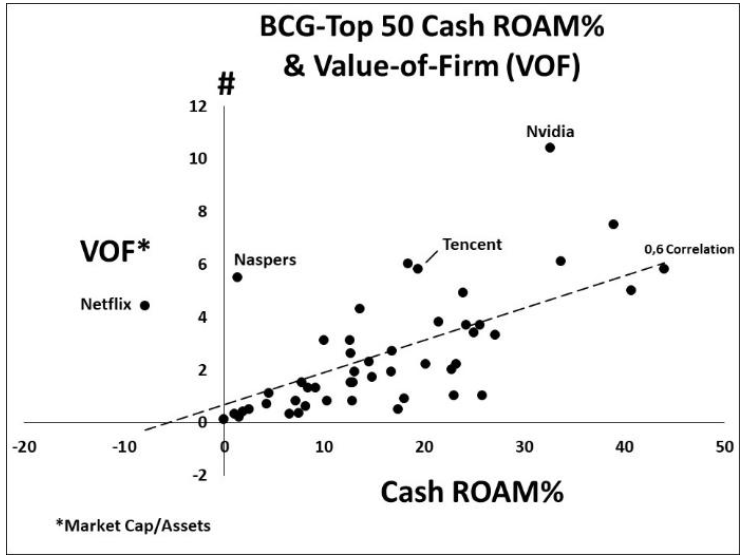 With an ATO of only 0.2 Naspers’ Cash ROAM is almost non-existent. Accounting Return on Equity (ROE) is high because of Tencent but Cash ROE is negative. This means that apart from Bekker, who hasn’t done half badly anyway, none of senior management should be rewarded by an increase in a share price governed by the fortunes of the buffalo. In the end, does the firm really qualify to be in the world’s Top 50 Value Creators? You decide. Next are the business sectors with an almost perfect correlation of 0.9. Technology and Media firms occupy 55% of the Top 20 and Technology firms alone occupy 35%, so we’ll put their sector numbers under the ROAM lens. 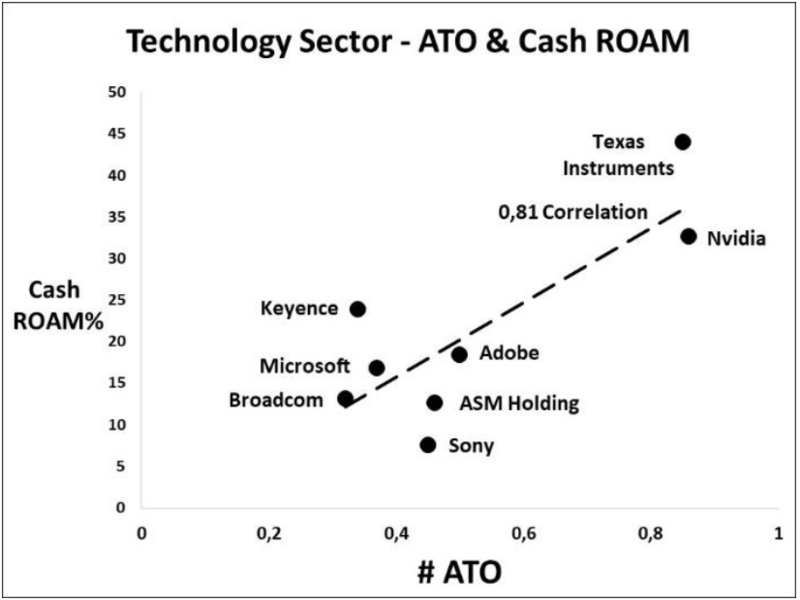 Starting with the senior synergist in the Cash ROAM equation – the sales productivity of their asset bases – it shows clearly how ATO can make or break your ROAM. The average ROS% for this sector is high at 43% with Keyence (Japan) the exemplar at 70%. However, ATO for the sector is only 0.41 which drags its ROAM down to 17.6%. Keyence’s ATO is even lower at 0.34 thus generating a ROAM of 24% despite its extremely high operating margin. 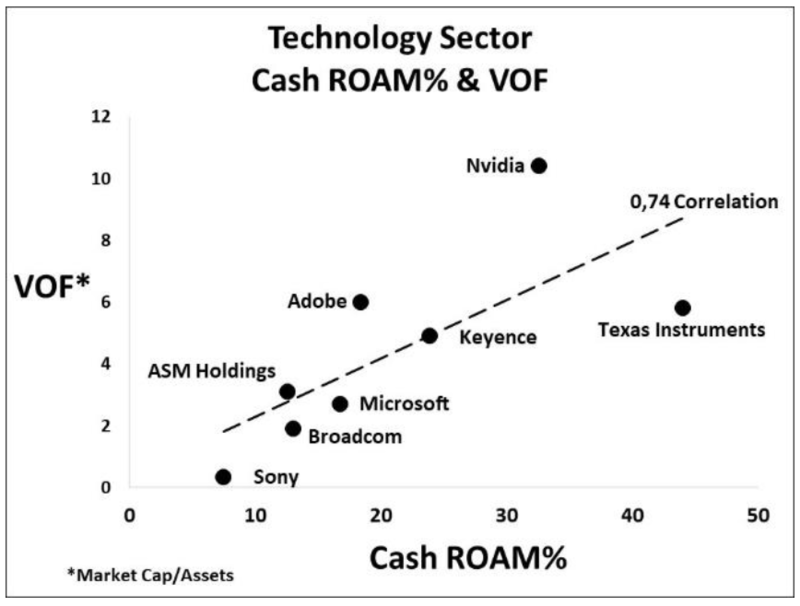 On the other hand, Texas Instruments and Nvidia, with ATOs of 0.9 – still low but double the rest – generate Cash ROAMs almost 130% higher than the sector’s average. The chart also illustrates the danger of a high operating margin based on high price advantage that market dominance gives you, not low-cost productivity. You raise a margin umbrella that shelters rivals who can sneak under it to disrupt the market and take customers away from you. Finally, here is the overall picture. Though a small sample, it shows the clear, fundamental link between Cash ROAM and market value. The big exception in the Top 50 is Netflix. Its market cap has almost doubled from the $83bn figure contained in BCG’s report to around $160bn. At the halfway mark in 2018, its Cash ROAM had moved up from minus 9.6% to minus 4.6%, which is good news. Given a comment in his half-year 2018 shareholder letters, CEO Reed Hastings, like Amazon’s Bezos, now seems to have shifted his focus from accounting GAAP numbers to cash – a good idea. At about a quarter of its size, his firm is valued as highly as Disney – now six times the value of his asset base. 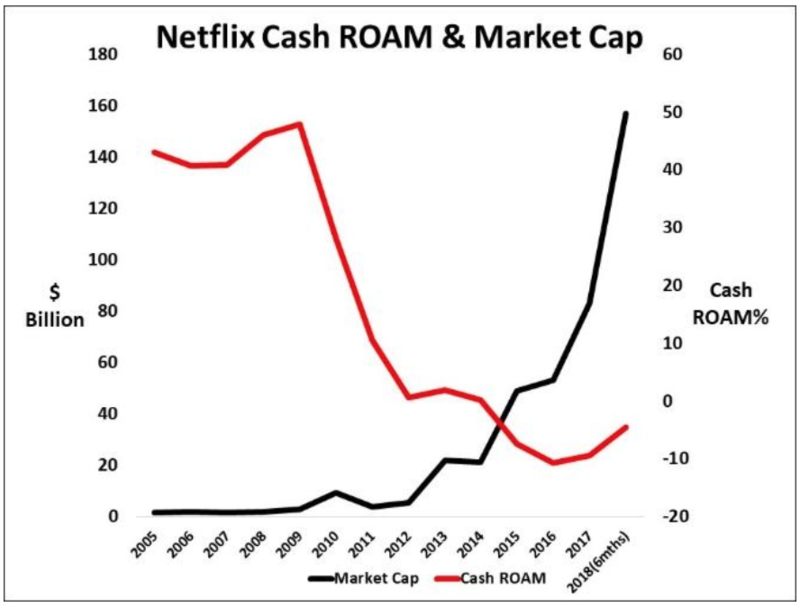 A difference is that Disney has Free Cash Flow that matches the amount Netflix spends each year on content streaming assets. That’s some war chest. In the end, what’s the message in these charts for managers and, in turn, investors who want to evaluate them? It certainly isn’t to focus on TSR and the share price. Fundamentally, the value of a firm derives from cash productivity of the asset base. It creates opportunity and you get that by focusing on customers, not dancing to the tune of the capital markets. The question, and answers prompted by it, can point to many ways for productivity improvement. If they only knew, customers would find that firms do a lot that’s of no value to them. Ted Black runs workshops, and coaches and mentors using the ROAM model to pinpoint opportunities for measurable, bottom-line, team-driven projects. He is also a freelance writer with several books published. Contact him at [email protected].